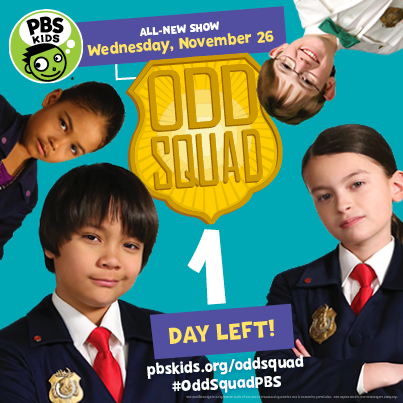 Mommy Maestra: Don't Miss the Premiere of Odd Squad! DON'T FORGET that ODD SQUAD premieres tomorrow, Wednesday, November 26, right after CURIOUS GEORGE: A Very Monkey Christmas on PBS KIDS! My son has been counting down the days and CANNOT wait for tomorrow's premiere of the new PBS KIDS series aimed at boosting math and science skills in early elementary skills. Tomorrow's Christmas special has special agents Otto and Olive helping Santa find his missing reindeer (he accidentally shrank them!) by following a pattern. It's funny, clever, and sooo creative! If your kids love stories of adventure, intrigue, and ingenius solutions by kids just like them, don't miss tomorrow's episode. We first learned about the Odd Squad while completing a survery for the PBS Viewers Like You advisory panel (if you'd like to share your thoughts and opinions on new and upcoming PBS programming, sign up here). We've watched countless clips and screeners and now my son is HOOKED! So if you have kids at home, why not kick off the holiday season with all the holiday-themed shows from PBS KIDS?